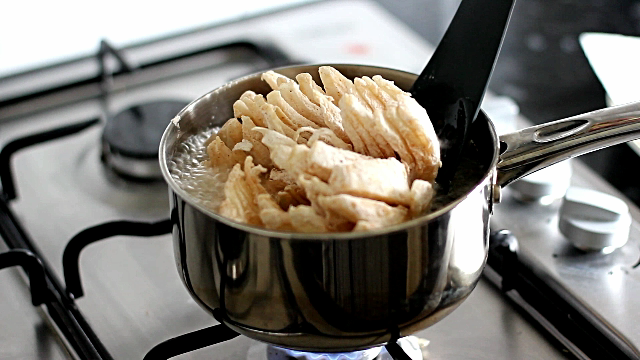 Forget onion rings, watch this tutorial and learn how to make a showstopping flower instead! Blooming Onions have been a thing in US for quite sometime already, but I’ve only discovered them recently. I’ve been missing a LOT. They are so much fun to make! And super easy to make if you see my tutorial, so go check the video below or watch it directly on youtube. My awesome other-half ( who also happens to be a chef) was hand-modelling for all the chopping-dipping process, while I was in charge of the superbubbly frying bit. We both loved the beautiful flower that came out, crispy on the outside, soft on the inside and so so so tasty – What an amazing discovery! 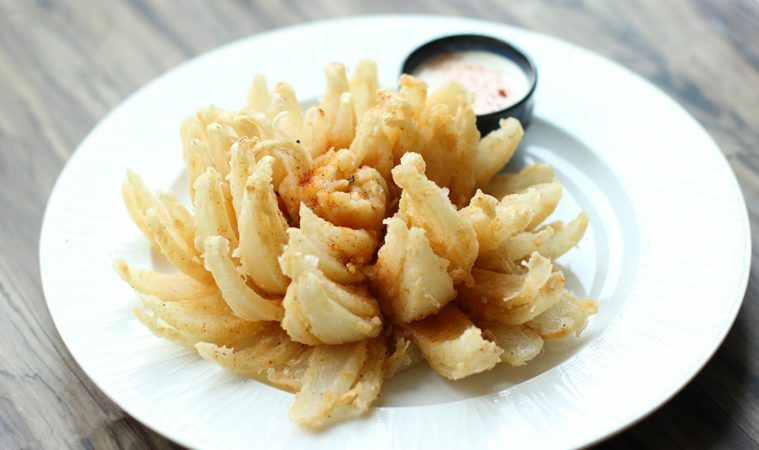 To make an onion flower all you need is: a big round white onion, 1 cup of flour, 1 egg + 1 cup milk beaten together, salt, pepper and a pinch of paprika. It couldn’t be more basic than this, but you’re welcome to add more spices and herbs like dried thyme, cayenne pepper or any others you fancy. To shape the onion into a flower first cut 1 inch off of the top to have a nice flat surface, but keep the other side ( root) intact. Now, make four incision 1/2 inch away from the bud, then make other three incisions between each original cut, to have pretty and even petals. Once you have your beautiful flower ready, mix the flour with all the seasonings in a bowl and add the egg+milk mixture into another one. 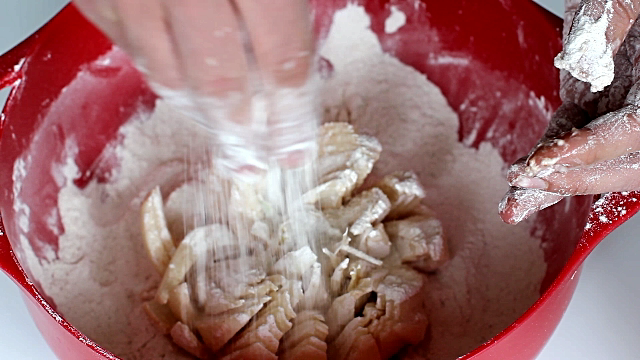 Dip the onion first into the flour, tossing it well in between the petals, and gently shake off the excess. 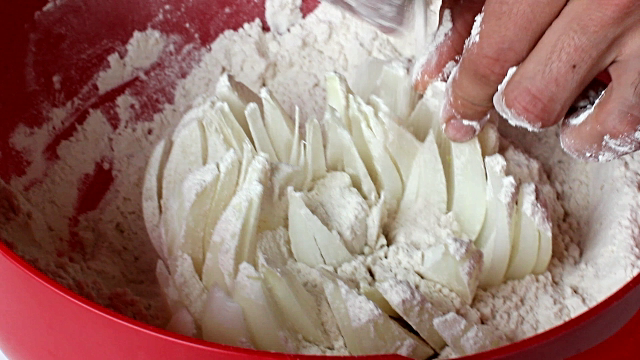 Now, dip the onion evenly into the egg+milk mixture and then coat it back liberally with the flour mixture. This double-dipping ensures you have a well-coated onion even if some coating will shake off during the cooking process. 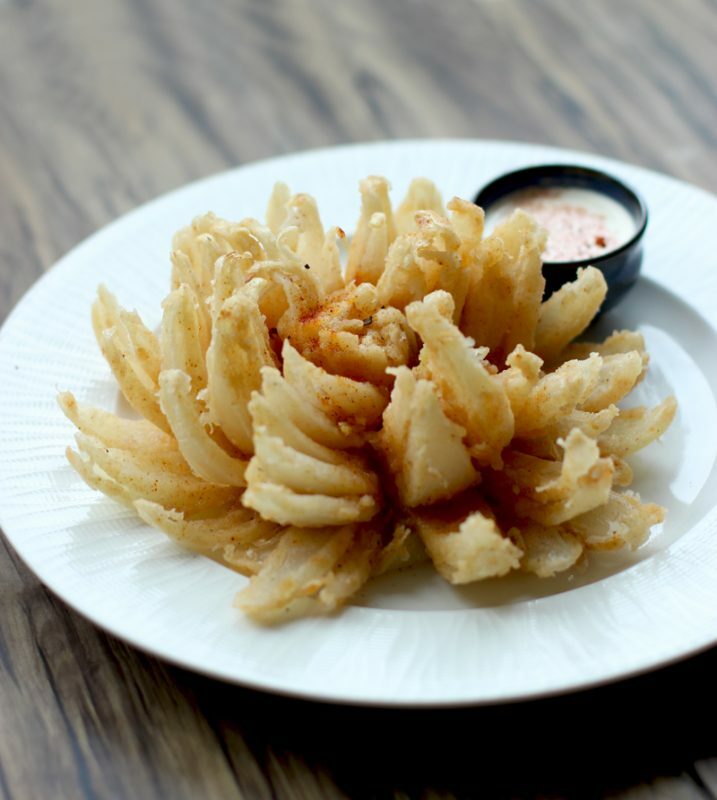 Once your onion flower is ready, you can deep-fry it straight away or refrigerate to set for about 30 mins first. 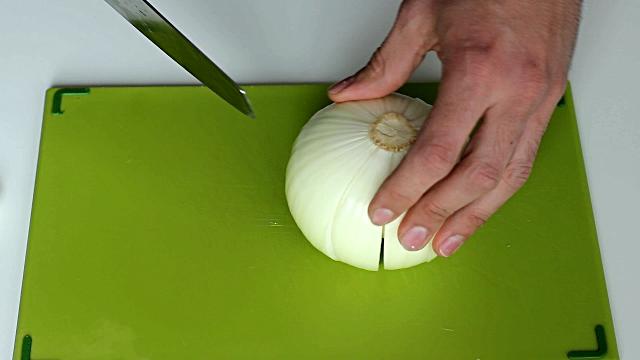 Allowing the onion to refrigerate will set the coating better, but if you’re in a rush and your onion is perfectly coated, then you can skip the step and fry directly. Make sure you keep your pot of oil at a temperature of 350F/175C so it doesn’t burn, and use enough oil to completely ( or almost) cover the onion when it fries. I’ve used a very small pot, only because I didn’t have much vegetable oil ( not a big fan of deep-frying usually! 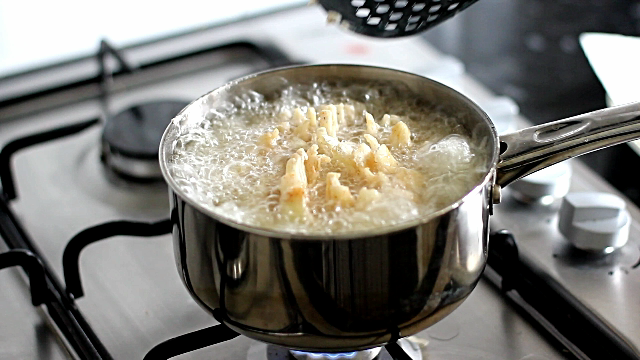 ), but you’re safer with a larger pot as the oil gets quite bubbly while frying. 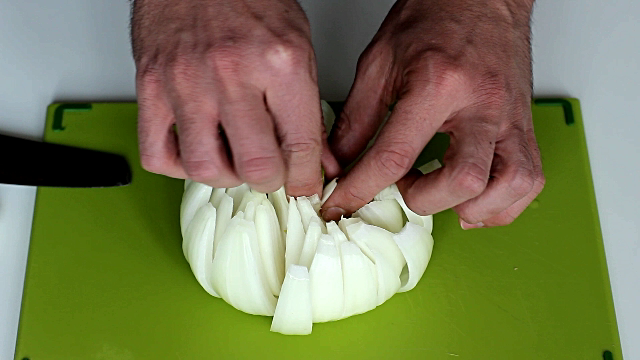 Cook the onion on each side for 4-5 mins or until is golden brown on both sides. Drain on kitchen paper and serve with your favorite dips, I made sure there was a pot of homemade mayo waiting for this awesomeness. This crispy mouthwatering bloomin’ onion is a fantastic party idea or just as perfect for 2 to share. I think is the first time ever I prefer flowers to rings! Hope you like the video, if you do, put a “like” on it! And don’t forget to subscribe to The Petite Channel! I LOVE your video! It really makes me want to make a blooming onion right now! 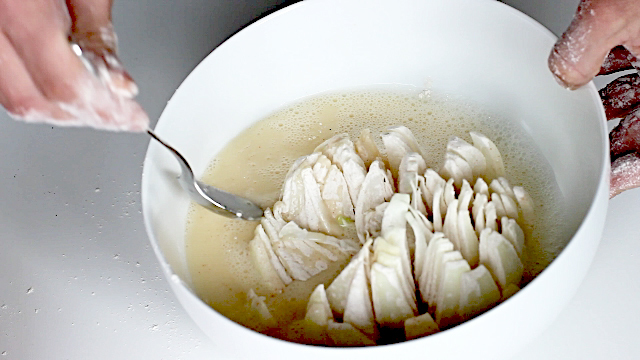 Have you ever tried this with small onions?